Lest we forget - in 2017 nations will join together in Flanders’ Fields to commemorate the centenary of the third Battle of Ypres. Culminating in November 1917 with the capture of the ridge at Passchendaele, it was a defining moment in The First World War. Over one million British people gave their lives in service to their country during The Great War – in honour of their bravery and sacrifice, a new limited edition commemorative coin has been issued. 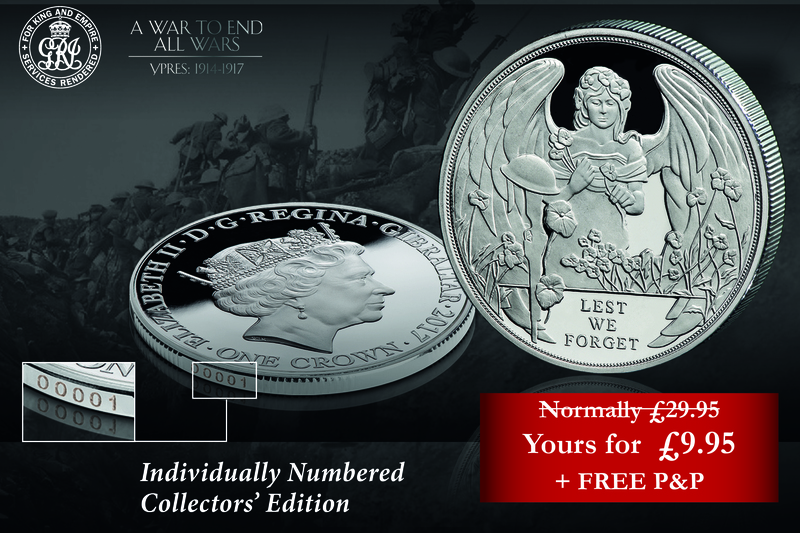 The Ypres Centenary Coin is a special collector’s limited edition. Each coin is individually numbered, meaning your coin is the only one with that number, which makes it completely unique to you. The earliest orders will receive the lowest numbers. Struck to the highest quality Proof finish, and limited to just 25,000 worldwide, this centenary coin features the symbol of remembrance from Flanders Fields - the poppy, set against the backdrop of the Angel of Mons who is said to have protected the British soldiers during the war. Framed beneath the angel herself are the words of Rudyard Kipling – ‘Lest we forget’, a poignant reminder of the enormous debt owed to those who sacrificed their lives for our freedom. Your coin comes presented with the First World War Centenary Presentation Folder and a Certificate of Authenticity guaranteeing the coin’s specifications. This informative presentation pack is normally £2.95, but as a valued customer of The London Mint Office, it can be yours FREE with your order. The Ypres Centenary Coin is the first coin in a set that honours the courageous British Forces during The Great War - those of Land, Sea and Air. Each of the next three coins in this set is layered in pure 24 carat gold and struck to crown size - 38.6mm, the traditional size reserved for commemorative coins. Only 9,999 complete First World War Centenary Sets have been issued worldwide and you are guaranteed a total saving of £17.95 across this set when you order today. In 2017 nations will come together in Flanders’ Field to commemorate the centenary of the Battle of Ypres. Join with them in remembrance by ordering your Ypres Centenary Coin today. The Ypres Centenary Coin is a poignant reminder of the enormous debt owed to those who fought on Flanders’ Fields and sacrificed their lives for our freedom one hundred years ago. It is just the first coin in The First World War Centenary Set - a set which honours the courageous British Forces during The Great War - those of Land, Sea and Air. Layered in pure 24 carat gold and struck to crown size - 38.6mm, the traditional size reserved for commemorative coins, only 9,999 First World War Centenary Sets have been issued worldwide. This means less than 5% of all people who own the Ypres Centenary Coin will be able to complete their sets. Astonishingly, the remaining 95% will be disappointed. Each of the coins in the set is struck to the highest quality possible – Proof and comes with a Certificate of Authenticity, attesting to the specifications and edition limitation of the coin. Don’t miss this opportunity to honour the bravery and sacrifice of the forces of Land, Sea & Air - the normal price of the remaining three coins in this set is £34.95 each, but as part of the First World War Centenary Set you may own each coin for just £29.95. That’s a total £15.00 saving on the normal price. You need send no money now. Payment will not be due until you have received your coins and have made the decision to keep them. The remaining coins in your set will be sent to you at monthly intervals, entirely on approval and without obligation. You may return any coin within 14 days and stop collecting at any time. 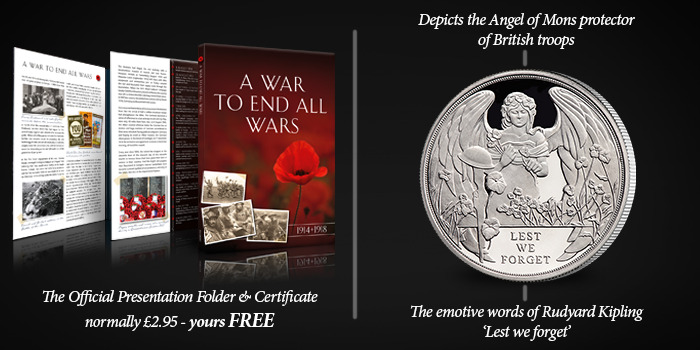 Each coin is accompanied by a Certificate of Authenticity plus you will receive the official First World War Presentation Folder – normally £2.95 FREE of charge with your order.